There is one thing that every Easter should have and that is a chocolate bunny. I had such a fun time making this Chocolate Bunny Paper Easter Card because the bunny has such a cute little vest and a fuzzy tail. These are bunnies that you are sure to send out to everyone special in your life. 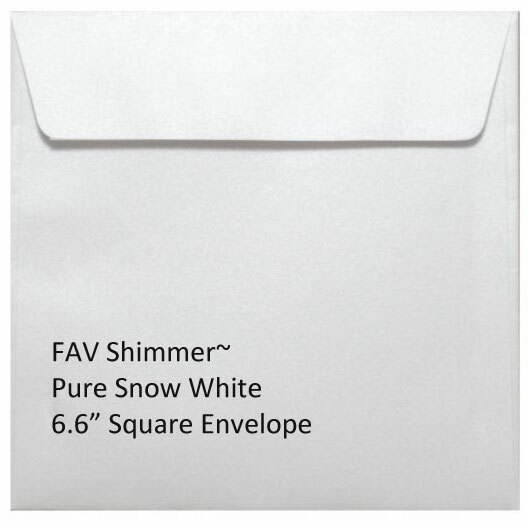 This whole project fits into the Pure Snow White 6.6-inch square envelope, thus making the card itself to fit inside it 6.25-inch square. Most of the card is made of the Steel, Matcha Tea, and Pastel Pink all three are matte finishes and are perfect subtle color mixes. 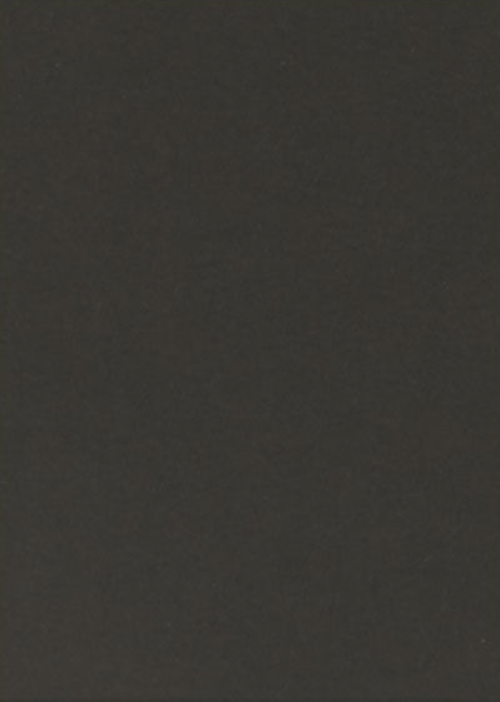 They are uncoated and print using either ink jet or laser printers. They are completely biodegradable and recyclable. They are also able to be embossed deeply and well without tearing. The embossing plates are Darice, for Cuttlebug, and are Floral Screen and Diagonal Lines or use anything similar that you have. The grass is Martha Stewart’s Punch, Grass. 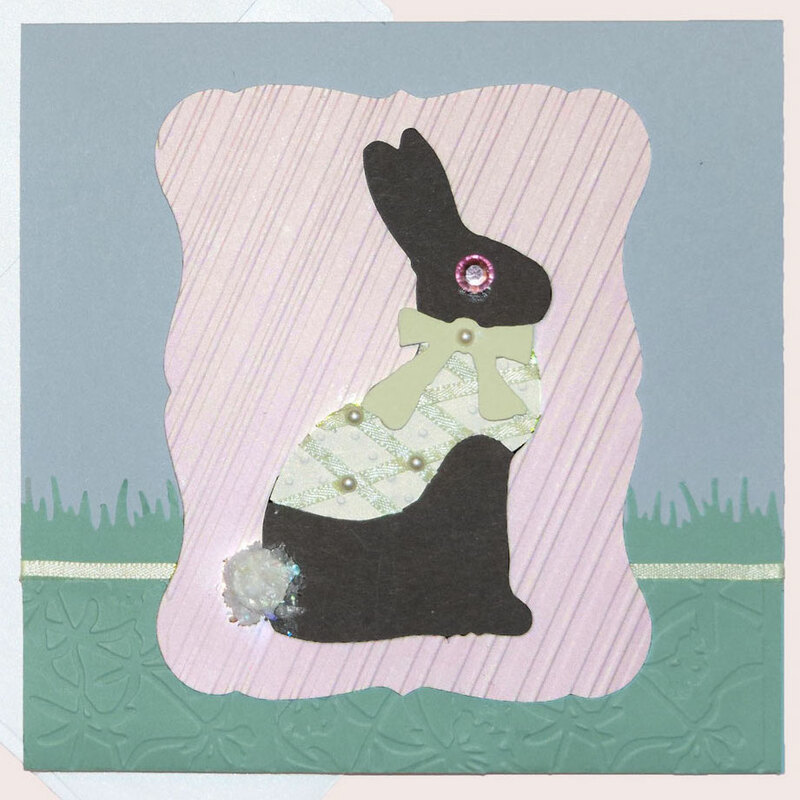 The bunny is immortalized by Tim Holtz alterations: Easter Elements and includes the little bow. The jacket is a second bunny, which is cut into a vest, after being embossed with Spellbinders M-Bossabilities, Dainty Dots. Now that we know what we are using, let’s assembled the card. 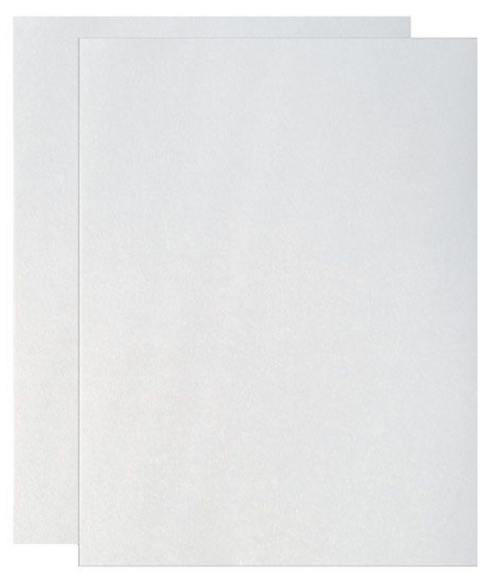 Cut the Steel to 6.25-inch x 11-inch and score it at 6.25-inch leaving the short flap as the front flap. To extend the length, cut a piece of Matcha Tea to 6.25-inch x 5-inch, and using the Grass punch, punch along the 6.25-inch side. Actually my piece was a little wider since the punch always leaves an edge and then trimmed back. Now emboss it with the Floral Screen; you will have to do one side and then the other, matching them to the design. Using 1/2-inch ScorTape applied to the top and back of the front flap, peel off the front backing first and hold the Matcha Tea, folded in half, along the bottom of the back flap. Tape it with masking tape if you need to and push down the front flap, folding the Matcha Tea over so the grass shows on the front. Pull the ScorTape from the back of the Steel and fold over the Matcha Tea. Just keep referring to the photos as you go along. Cut some 1/8-inch light green double sided silk ribbon to about 2-inch long. Put 1/8-inch ScorTape about .5-inch below the bottom of the grass and starting in the middle of the ribbon, put it on the ScorTape. Once it is even, add a little more ScorTape only on 2-inch on each side on the back of the flap. You leave the middle of the paper so that you can tie the bow. It took a few tries to get the knot tight, but once you do, pull the bow tight and add more ScorTape to the tails. Make it symmetrical and trim the ends. Add some Cosmic Shimmer Glue to the back of the ribbon and a 1/4-inch bling later to add some shine. 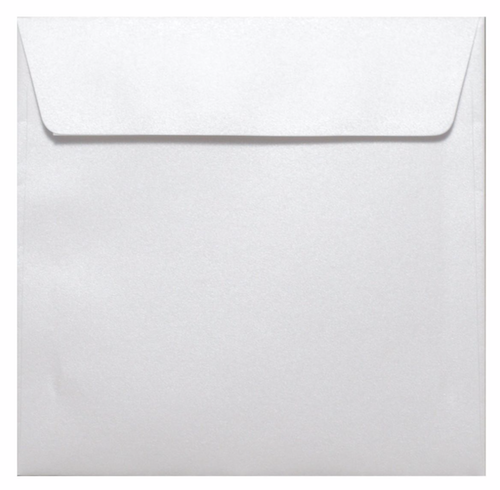 Add it at the end of the card so that you will have a flat surface to decorate the front of the card. 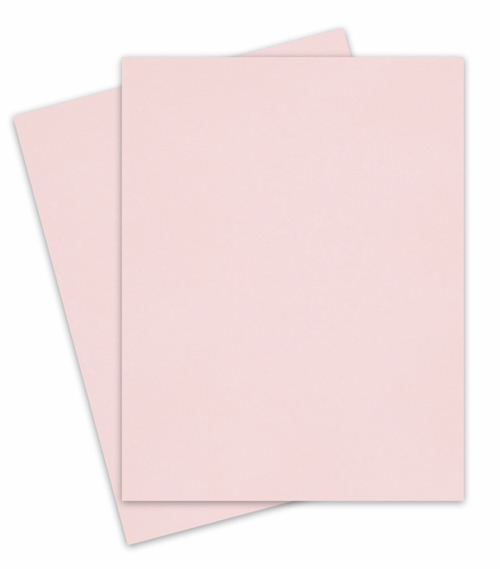 Die Cut the Pastel Pink with Memory Box, Debutante, and emboss it after cutting, with the Darice, Diagonal Stripes. 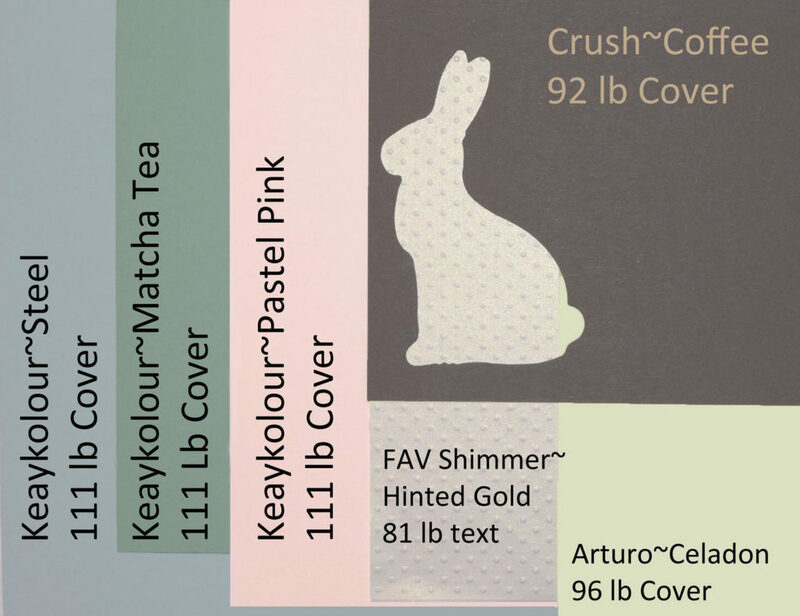 The bunny is Crush Coffee and is timeless. 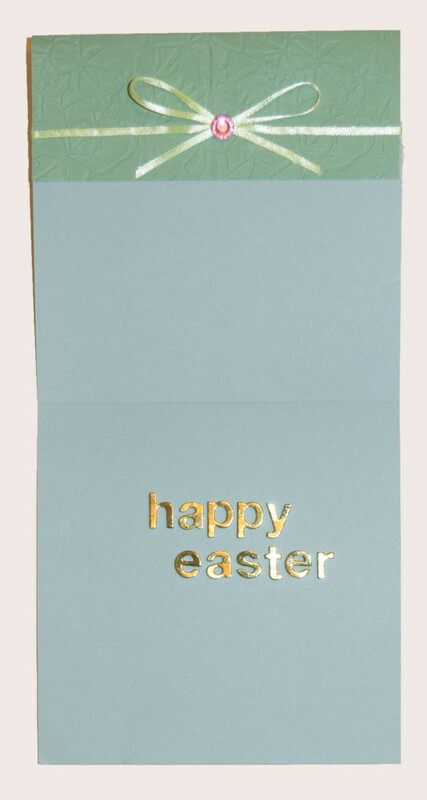 It is Tim Holtz, Alterations, Easter Elements. 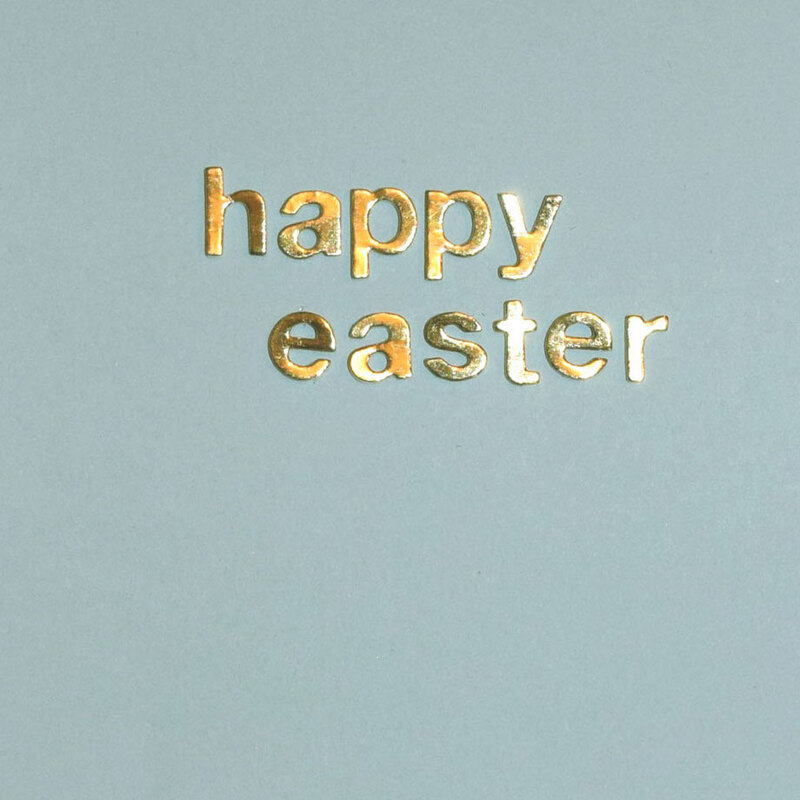 Cut a second bunny from Hinted Gold and emboss it with Spellbinders M-Bossabilities, Dainty Dots. This was cut after it was embossed. 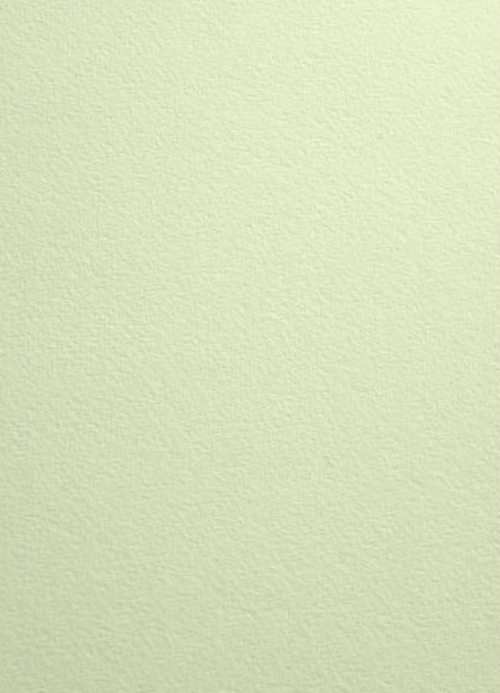 The Hinted Gold is a white base paper with a gold sheen when you turn the paper. Just using your eye, cut a little vest from the bunny; leave room for his little bunny legs and cover his back. The neck will fit under the bow, which is die cut from Easter Elements using Celadon. Put a little piece over the bow shape and die cut it. 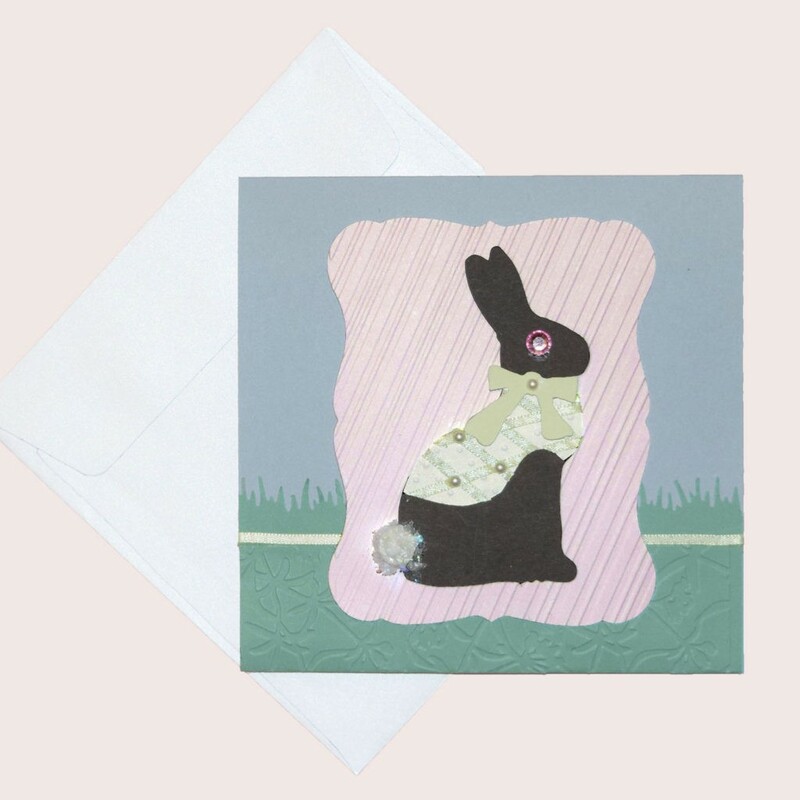 Easter Elements is a deep dish die, so if you need to, you can trace it and hand cut the bunny and the bow. Using the same 1/8-inch light green ribbon, cover the back with the 1/8-inch ScorTape and apply it in a pleasing crisscross pattern on the bunny’s vest. ScorTape it onto Mr. Bunny. Add the bow and cover both the vest and bow with tiny 1/8-inch tiny little pearls. Cosmic Shimmer Acrylic Glue was applied to the back with a toothpick before applying. Mr. Bunny’s tail is a foam dot that is 1/4-inch wide and 1/8-inch deep. Cover the back with Cosmic Shimmer Acrylic Glue and press it on. Using your toothpick, pile on more glue on top of the foam dot and be sure to cover the edges of the dot. Add some Original Buffalo Snow Flakes and press lots of them onto and around the dot. Add more glue to the back of a 1/4-inch pink crystal round and add the eye. On the inside apply the “happy easter” using Thickers Alphabet “Happy” and press down; mine didn’t need extra glue. I searched high and low for capitals for the “h” and the “e”, but even online they could not be found. They are 5/8-inch tall and the capital letters from other styles just didn’t look right, so I went with the casual look since I really like the letters and they way they stood up inside. The sides of the letters just happened to be a blue foam that went with the Steel. Add your pink crystal to your ribbon bow on the inside and make some really happy for Easter. Stars and Stripes Card is here just in time!